YOUNTVILLE, Calif. (AP) — Three workers for a program that treats veterans for post-traumatic stress disorder were found dead Friday along with the suspect who took them hostage at the largest veterans home in the U.S., officials said. The four bodies were discovered nearly eight hours after the gunman slipped into an employee going-away party in a building where combat veterans of Iraq and Afghanistan receive treatment, said California Highway Patrol Assistant Chief Chris Childs. The three female victims were employees of the nonprofit organization Pathway Home treatment program, which is housed on the campus of the Veterans Home of California-Yountville. Childs said it was "far too early to say if they were chosen at random" because investigators had not yet determined a motive. Although authorities called the workers hostages throughout the day Friday, it was unclear how long they were alive held by the gunman. The only shots that were heard at the center happened at around 10:30 a.m., when authorities say the suspect arrived. Throughout the day, authorities said they had been unable to make contact with the gunman and the bodies were found at around 6 p.m.
"This is a tragic piece of news, one we were really hoping we would not have to come before the public to give," Childs said. Napa County Sheriff John Robertson declined to identify the victims and the gunman Friday night, saying family members still needed to be notified following the attack at the state-run Veterans Home of California-Yountville, in one of Napa Valley's most upscale towns in the heart of wine country. Yountville is about 53 miles (85 kilometers) north of San Francisco. A sheriff's deputy responding to an emergency call shortly after 10 a.m. got into a shootout with the gunman, but the officer was not injured. Highway Patrol Sgt. Robert Nacke said negotiators were unable to make contact with the gunman throughout the day. Larry Kamer told The Associated Press that his wife, Devereaux Smith, was at a morning staff party and told him by phone that the gunman had entered the room quietly, letting some people leave while taking others hostage. Smith, a fundraiser for the nonprofit Pathway Home, was still inside the facility's dining hall and was not allowed to leave, he said. The Pathway Home, a privately run program on the grounds of the veterans home, treats veterans of the Iraq and Afghanistan wars with post-traumatic stress disorder. Police evacuated the property and closed off nearby roads. An armored police vehicle, ambulances and several firetrucks were at the facility, which houses about 1,000 residents. Army veteran and resident Bob Sloan, 73, was working at the home's TV station when a co-worker came in and said he had heard four gunshots coming from the Pathway Home. Sloan sent alerts for residents to stay put. 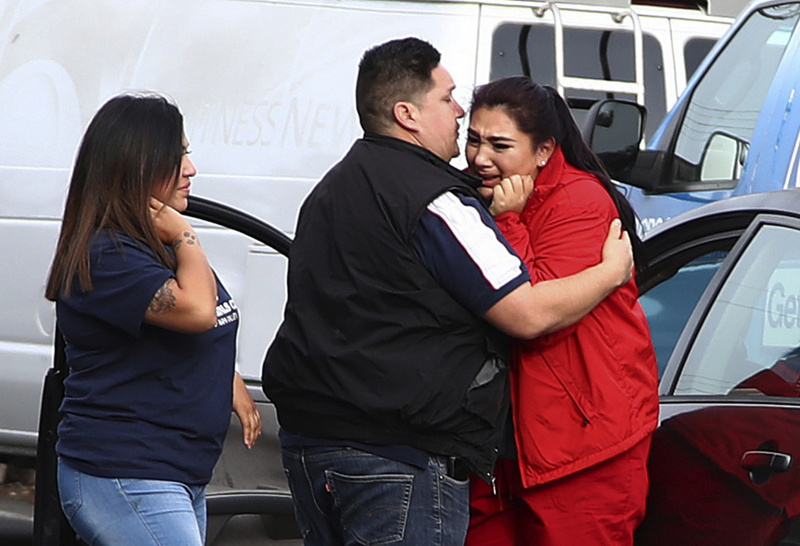 Jan Thornton of Vallejo, California, was among hundreds of relatives worried about how their loved ones were coping with the lockdown. Thornton said her 96-year-old father, a World War II fighter pilot, was inside a hospital wing and that she had reached one of his friends who said he was safe. Still, she worried about the stress of the lockdown, considering her father's age and that he has PTSD and some dementia. Thornton said her "heart just bleeds for the people that are being held hostage." A group of about 80 students who were on the home's grounds were safely evacuated after being locked down, the sheriff said. The teens from Justin-Siena High School were at a theater rehearsing a play. "They were a distance away from the shooting situation," Robertson said. Some of the children were driven away on school buses and others in cars. Sasha Craig spotted a car carrying her 15- and 17-year-old children and ran toward it blowing kisses. "There are my kids," she said. Like many parents, she was texting with her children inside and said the teenagers were telling their parents to "chill." The state Veterans Affairs department says the home that opened in 1884 is the nation's largest veterans home, with about 1,000 elderly and disabled residents. Yvette Bennett, a wound-care supply worker who supplies the veterans center, was turned back when she tried to deliver what she called urgently needed medical supplies for two patients inside. Of all the medical institutions she has worked with, "this is the most placid, calm, serene place," she said. Earlier this week, when she last visited, she asked a doctor, "What's your magic here?" "And then 48 hours later this happens," Bennett said. Yountville is a small town that's home to wineries such as Domaine Chandon, which is less than a half-mile from the veterans facility, and Thomas Keller's famed restaurant The French Laundry, which is about a mile away.